Last October I was honored to be featured in an article about using light modifiers in the studio in Popular Photography Magazine. 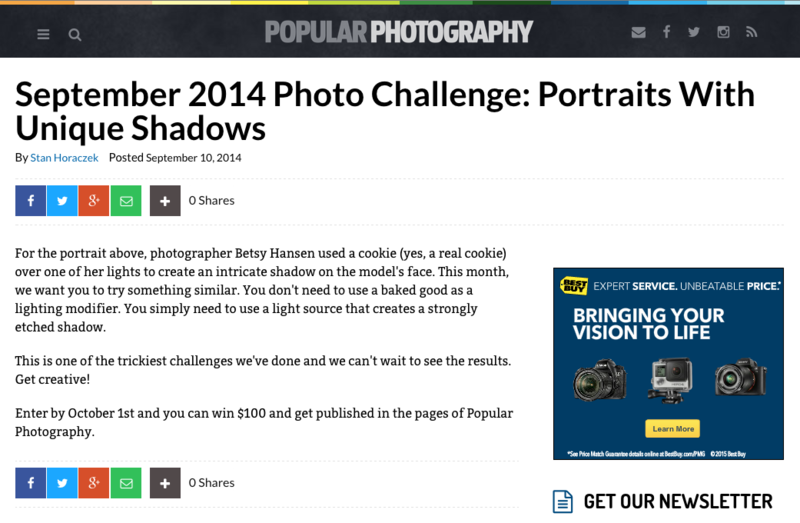 In updating some links on my website, I came across a short blurb on their website promoting a monthly photo challenge requesting photos with unique shadows. They used my photo for the contest, the same photo that was featured in the magazine. I’m pretty sure I know how the writer came to the conclusion that I used something from the bakery as part of my equipment arsenal. Do you remember the game telephone? Well, this game of telephone went something like this. The original article in the printed magazine issue stated that I used a die-cut piece of paper over my studio strobe to help create a pattern of shadows. The information in the original article is correct. The final step, which is where the baked goods come into play, is when I assume that the writer mistakenly read the online article and the term cookie stuck in their head. That somehow got translated into an actual cookie for the photo contest. The humorous thing is that the online article was written by the same person who wrote the little blurb about the photo contest. How does information get twisted like that when it’s the same person writing both items? I could understand if it was two different people, and maybe the person writing the photo contest blurb didn’t have an understanding of photography. A photography “cookie” turning into an actual cookie would make sense in that scenario, but that was not the case. I’ve had several great laughs over this error. It’s wonderfully comical! I’m not keen on people thinking that I actually stick cookies onto my lights to create shadows. Seriously, the chocolate chips would be a melty mess! But, it’s a fun story about things that actually happen to photographers, and I get to share it with you. Don’t believe everything you read on the web.